This amazingly breathtaking, 2200-square-foot, two-level home has three bedrooms and two-and-a-half baths. 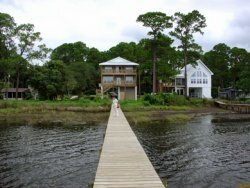 Enjoy relaxing in a secluded, non-smoking, oceanfront home with boat dock that provides all the aspects of secret a getaway. 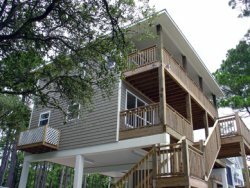 With two decks and a covered porch allows for relaxing sunset views. Brilliant light shines through the abundant windows and lights the fabulous interior. Relax on the expansive covered deck. View the emerald waters of the Gulf of Mexico from the balconies with each bedroom having an expansive view of the Gulf of Mexico below. The balconies affords privacy and an unobstructed view you will never forget. 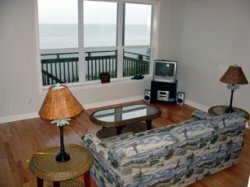 The fully-equipped kitchen has spectacular views of the Gulf of Mexico... It is the kind of place where you want to linger for a second cup of coffee and wish time could stop to savor the moment. This home is ideal for couples and families who wish to vacation together but desire some private time on their own. You will not be disappointed! 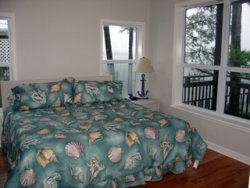 The first-floor master bedroom is a king-size bed and remaining second and third bedrooms both have a queen-size bed. The living room has a sleeper sofa which is a queen. Please contact us by phone for a more detailed, personal description at our toll free number below.